Hard-Hit Boomtown Considers Emergency Measures Only a couple of years ago, Port St. Lucie, on Florida's Atlantic coast, was the fastest-growing city in America. But desperate times have led the county commission to consider declaring itself a disaster area. 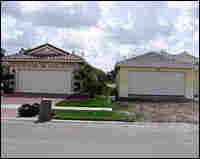 An occupied home sits next to an unfinished house in a Port St. Lucie senior community in 2008. All construction in the neighborhood stopped after the developer declared bankruptcy. Only a couple of years ago, Port St. Lucie, on Florida's Atlantic coast, was the fastest-growing city in America. A combination of cheap land and beautiful weather created a building boom. Now, the party is over. With the collapse of the housing market and rising unemployment, the county government is considering declaring itself a disaster area. Port St. Lucie is located in what's known as Florida's "Treasure Coast." During the area's building boom, lots of treasure seekers moved here — attracted not by sunken Spanish galleons, but by affordable housing. 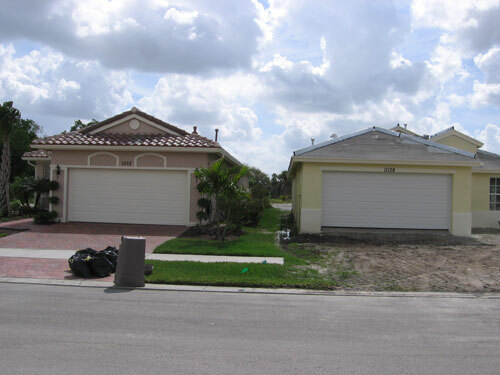 Today, Port St. Lucie, the largest city in St. Lucie County, is a suburban dream gone bad. It has the nation's eighth-worst foreclosure rate. Overgrown lots, vacant houses and "for sale by bank" signs are found on nearly every block. What Happened In Port St. Lucie? Brad Hunter, an analyst with housing research firm Metrostudy, says St. Lucie's blessing eventually became its curse. "Too many houses got built, ultimately because too many developers were drawn by the large land supplies available," he says. "People were enticed to buy the homes because they kept going up in value, or in price. So ultimately, it was the same kind of boom that happened everywhere, but it just happened to a greater degree in St. Lucie," Hunter says. Many retirees moved here, as well as people looking for jobs in the busy construction industry. You can find some of both lining up for the free hot meal every Thursday at St. Lucie Catholic Church. Diner Dennis Gonzales has been laid off from his construction job for two years. "I've seen a lot of people out of work," Gonzales says. "I've seen a lot of people losing their homes right now. I've seen a lot of foreclosures." In the past year, church volunteers say they've seen the number of people coming in climb from a few dozen each week to more than 150. Across the parish hall, Johnny Sweeney is there with his wife and three daughters. "Well, I'm a mortgage loan officer, so I've seen a lot," Sweeney says. "This area's really depressed. The hurricanes created a huge construction boom. A lot of people moved here from out-of-state to make big bucks. Then all of a sudden, everything crashed on them." That's the backdrop for a proposal made recently by St. Lucie County commissioner Doug Coward. Coward wants the county to declare a state of emergency. Doing so would give administrators access to $17 million in county emergency reserve funds. That money, combined with a transportation fund and other accounts, would give St. Lucie $20 million or $30 million to spend on building projects: research parks, highways and other infrastructure improvements. Some commissioners say they're unsure about dipping into funds that might be needed for hurricanes or other future disasters, but Coward says the emergency is now. Unemployment is at 10 1/2 percent and last year, nearly 11,000 homes went into foreclosure. "That impact far exceeded the cumulative impact of three hurricanes that hit us in 13 months," Coward says. "So I believe the economy has risen to the level of a man-made disaster and that it would be appropriate for us to consider using some of those dollars to assist local residents through job creation." St. Lucie is the first county in Florida — and probably the nation — to consider declaring what might seem like an extreme measure. Coward says beyond freeing up money, it would have another practical benefit. A disaster declaration would allow the county to streamline the bidding process and allow officials to reserve contracts for local companies and workers. While it's waiting for federal stimulus dollars to trickle down, Coward says this is a way for St. Lucie County to move quickly to put its people back to work. "I believe that the economic crisis is something our nation is going through," he said, "and it's incumbent on all levels of our government to step up and try to contribute toward solutions." St. Lucie's county commission is expected to vote on the economic disaster declaration within the next few weeks. In the meantime, St. Lucie is talking to other nearby counties about pooling their funds and making it a regional initiative.